In a poll that was conducted on 15 Iyar 5775, 80% of secular Israeli Jews responded that they would not have had Orthodox weddings if they had been given other alternatives. This is a dramatic increase from 67% during the summer of 2013. Nearly half of the Jewish public (49%) say they would marry outside of the rabbinate, given the option. This is also a significant increase from 39% in 2013 and 35% in 2009. 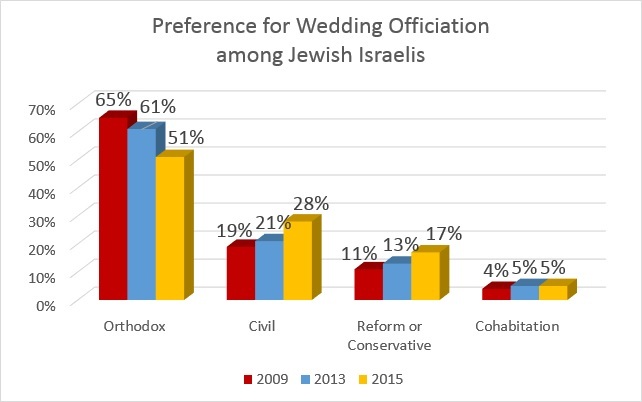 The number of Jewish Israelis who prefer to get married in an Orthodox wedding ceremony reached an unprecedented low of 51%, compared to 61% in 2013 and 65% in 2009. 54% of women prefer a non-Orthodox wedding ceremony, versus 44% of men, citing the non-egalitarian nature of weddings conducted by the Chief Rabbinate. These dramatic findings should be understood in the face of Israel’s legal reality, which only recognizes the legal validity of Jewish weddings officiated under the auspices of the Chief Rabbinate, to the exclusion of civil and non-Orthodox religious weddings. The question posed in the poll was: “If you or one of your children wanted to get married, which religious framework would you choose (assuming that all of these options exist and are recognized as equal in the eyes of the law)”. Only 51% of the total sample said they would prefer to have an Orthodox wedding, and of the 49% who preferred an alternative: 28% would prefer a civil marriage, 17% would prefer a Conservative or Reform wedding, and 5% would choose to live together without getting married. 80% of secular Israelis, 54% of the non-chareidi population, and 89% of immigrants from the former Soviet Union would prefer not to get married in an Orthodox framework. 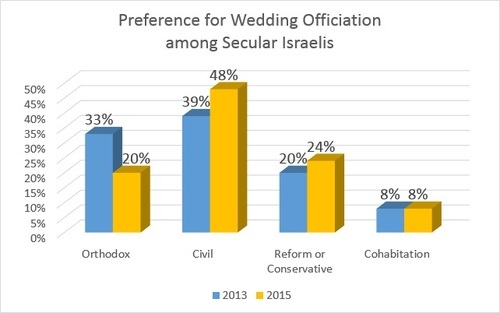 Even among traditional Israeli Jews, more than one third (35%) would prefer a non-Orthodox wedding framework. However, 65% of traditional Israelis, 96% of the religious Zionists, and 100% of the chareidi population would prefer an Orthodox wedding ceremony. Preference for non-Orthodox marriages is seen among a majority of those who voted for the Zionist Camp (Labor), Kulanu (which joined Netanyahu’s coalition), Yesh Atid, Israel Beitenu and Meretz. 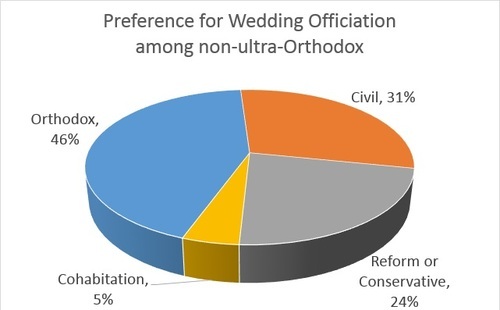 Even among Likud voters 44% preferred non-Orthodox marriages. These findings were part of a public opinion poll commissioned by Hiddush and conducted by the Rafi Smith Polling Institute for Lag B’Omer. The poll was based on a sample of 500 people, representing the adult Jewish population, with a margin of error of 4.5%. They surveyed a few people those who they thought would give them the results they wanted. Wow. What a great article by the “deformed” lobby group. Who takes this seriously? Stop giving Uri Regev airtime. . His movement denies the divine origin of the Torah. The Chief Rabbi of Denmark was asked on Danish TV how he could support Bris if 75% of those polled in Denmark are opposed . His response:The zoo in Copenhagen recently put a giraffe to sleep even though some 75% of those polled were opposed to it. When something is right and necessary and,you do what you have to do and ignore the polls. Now one can understand why the Gedolim were so adamant with Ben Gerion that all marriages must be carried out by Orthodox Rabbis. Can you imagine what type of mess Klal Yisrael would be in right now if they weren’t? How many mamzerim there would be! How many people would be marrying goyim (such as Russians that came here along with the Jewish Russian immigration in the early 90’s) and producing goyishe kinder that thing they are jewish! It would be terrible! It doesn’t matter what the survey says, people will do what they want regardless. Often people just think that if they compromise, that other people will come around. Like parents, they want to blame themselves(in this case, the rabbinate for not being inclusive, understanding, etc. enough). If I just make this change or if we just compromise, surely they will see our ways are good and they’ll do the right thing. These people are like most liberals who think that compromise solves all the problems. It will not, the will to do the right thing has to come from within the person and the changes that these well meaning people advocate will only weaken the tzibur and confuse those who are still observant. Many of these people advocating change do not even realize how their enthusiasm for “religious freedom” is akin to the Hellenism of years ago. Is this a Jewish State or not? On what right do we claim Eretz Yisrael if not on the Divine Promise? True, there are problems, Russian immigrants, Diaspora Jewry with all their different movements, but these problems are not solved by creating new ones. People have to be responsible for their own failings, don’t we see that all over the world? Why do you keep publishing self-serving surveys by a rabid anti-religious group like Hiddush? !They mean nothing except what Hiddush wants it to show-non one in their right mind would ever take Regev seriously! So people who aren’t frum prefer non-frum weddings. And this they call a “Hiddush”? In Israel there is only frum weddings, There is no secular weddings like in the states and the Charedi Rabbanut doesnt veer from that at all. The more Dati Leumi ones allow some deviance like double ring or encourging both husband and wife to go to the Mikvah. That’s a great reliable source. You can’t get more impartial to religion than Hiddush, can you? This is such a joke I don’t know why it was posted. Btw the one third of Israelis getting married abroad was published by the same ludicrous source. First of all double rings is nothing new, it was done generations ago in Europe and even before. The mikva is also something that all chassidim do (i mean men)Besides the Rabbanut calls themselves Dati not Chareidi. Every kosher Yid needs a sefer yichusin. Anyone who’s not charedi has to be considered safek goy and safek mamzer.